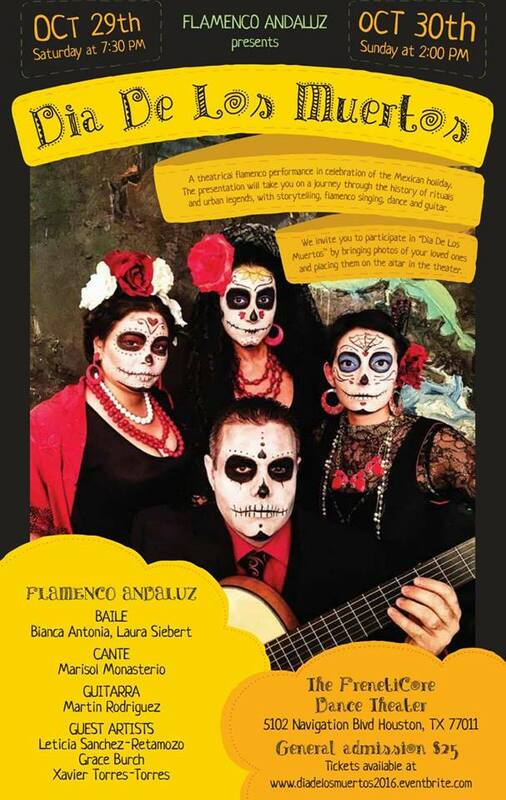 Flamenco Andaluz presents “Dia de los Muertos”, a theatrical performance in celebration of the Mexican holiday. The presentation will take you on a journey through the history of rituals and urban legends with storytelling, flamenco singing, dance and guitar. Guests are invited to participate by bringing photos of their loved ones and placing them on the altar in the theatre. *2 perfomances are offered: Saturday October 29th at 7:30pm and Sunday October 30th at 2:00pm. *General admission ticket price is $25. The FrenetiCore Dance Theatre is located at 5102 Navigation Blvd, Houston, Texas 77011. EuroCircle member, Marisol Monasterio, will be our host for this event. Please message Marisol if you have any questions. 2 EuroCircle events will be created for both dates.